This has troubled me for quite some time. I have witnessed healings and miracles, and I fully believe in the active presence of the Holy Spirit. However, just like everyone else, even I have doubts. I get frustrated when my prayers aren’t answered right away, and sometimes I can’t help but wonder if it was because I didn’t pray hard enough. Like I said before, we can all probably relate to these times of unanswered prayer. But we are missing something…This isn’t about us! Once again, I find myself writing these words. This is the truth–it’s all about Jesus. We can’t make our prayers come true no matter how often or how hard we pray. We are not God, and I think that’s quite a relief! Even though we might not see all of our prayers answered right away, we have to understand that God will work everything out for our good and His glory in the end. You see, none of us can really view the whole picture from where we’re at right now; we’re only allowed tiny glimpses. I truly believe that in the end, when we are face to face with Jesus, we will see how our prayers affected not just our own lives–but the lives of those around us. Last Friday I was supposed to tell you about my new position as Youth Leader for the student ministry of my local church (and of course I forgot). I feel so honored to be a part of this ministry; It is truly amazing how God will use us if we ask and are willing to step outside our comfort zones! While at one of our worship nights, I heard the youth pastor say something that really struck me: when we do things for others and step out in faith to pray for people, we are elevating Jesus above ourselves! When we are truly living life for God, we begin to realize that we are not the ones to be glorified–Jesus is. Very truly I tell you, unless a kernel of wheat falls to the ground and dies, it remains only a single seed. But if it dies, it produces many seeds. Anyone who loves their life will lose it, while anyone who hates their life in this world will keep it for eternal life (John 12:24-25 NIV). We are this kernel of wheat! Next time you find yourself stepping out in faith, whether it be through prayer, missions, a new career, or even just talking to somebody new–remember that your act of obedience and love is enough. 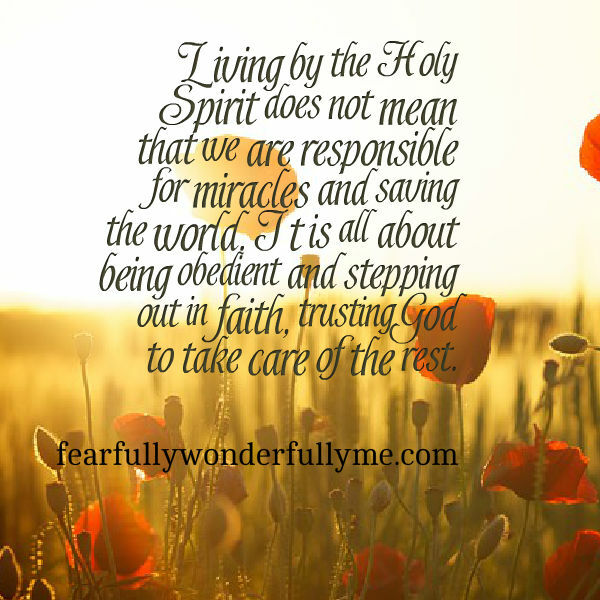 Living by the Holy Spirit does not mean that we are responsible for miracles and saving the world. It is all about being obedient and stepping out in faith, trusting God to take care of the rest. Thanks so much! It’s awesome when God leads me to write something. This post wasn’t even supposed to be about being led by the Holy Spirit! It’s amazing how the Lord works.